Practically no one feels the same level of OT school motivation by the end. It can be so exciting to start a semester! New classes and new areas of interest. All shared together with your classmates who you have become so tight knit with. However, the motivation for OT school can dwindle as the semester goes on the assignments begin to pile up. From the experience of a new graduate and current student, NGOT has your back. 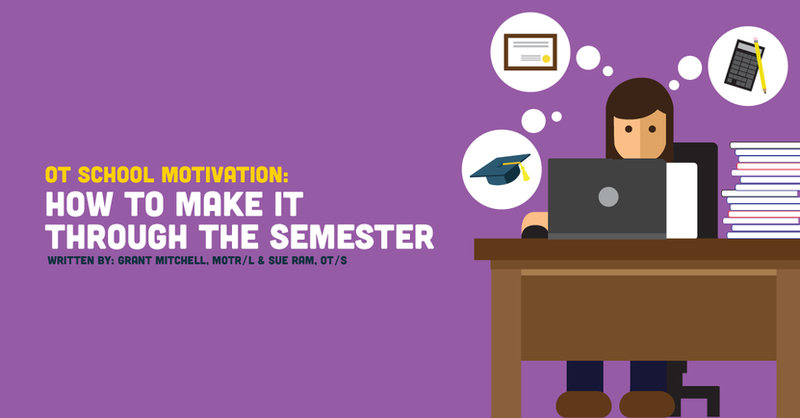 Here are six ways you can stay motivated through the semester! No matter who is in your social network, they are going to be your foundation for you OT school motivation. But, not everyone is looking to make friends towards the end of the semester. Let’s be honest, students are likely trying to put their social lives on hold. As future OTs, we know that social support is key to maintaining health. The number one most important quality for tolerating stress well, reported by a study of 246 students, was “feeling supported” (Bland et al., 2012). While much of “feeling supported” might be family, don’t lose hope in the friendships yet. What should you do? Isolation is a total motivation killer. As a current OT student and recent new grad, we have found that having a social support in our programs is and was crucial. Having someone who truly understands what we are going through, whether it is making it through a week jam-packed with exams and group projects to finding out you didn’t do so well in a lab practical, is an invaluable resource. While ambient noise may not replace social supports and studying, you could Facetime a study buddy friend or listen to coffee shop sounds to feel a little less alone. It's important to maintain communication both with professors and to maintain those relationships that support you. Early and often, active ongoing feedback is critical to OT program. However, it is best to build that rapport sooner, rather than later. One of the most valuable things you can do is stop by and say hi, or ask your advisor if there is a time you can stop by for a few minutes and roughly chat about how to finish strong. From personal experience, professors have been some of my biggest cheerleaders and motivators during OT school. Whenever you do something great, they’re excited for you and when you need help, they do everything possible to make sure you succeed. Remember, they were in our shoes before. Don’t be afraid. It happens to all of us, we get so consumed with our academic lives that we think we don’t have time for anything else. Sometimes, it can help us stay motivated to help others in need or to do something other than studying. Yeah, yeah, yeah, so social supports and communication are important, you’ve heard it before and it’s old news. Well, have you checked out AOTA’s student page yet? This is a great way to get involved while giving back to our national association. Through AOTA, you can find ways to volunteer your time and gain leadership skills all while meeting other awesome, motivated people like you! As a current OT student, you can get involved with AOTA through participating in events such as Backpack Awareness Day or Capitol Hill Day. These events can allow you to meet other friendly OT students across the country. In pediatrics and mental health, coping skills are frequently used, though they can come in handy in any setting and ever especially in personal life too! One of the best things we can do as OTs is model behavior. That is not to say that we won’t struggle with stress or mental illness. OTs are still human even though it’s sometimes easy to mistake a group of OTs for the Justice League. "Coping skills" is a vague term that can in some ways encompass areas of occupation as well as interpersonal skills such as gratitude. Here are a few cool ideas to inspire you. A healthy habit and your lost friend. We as OTs literally study the value of sleep hygiene, probably one of the most undervalued areas of occupation. But do you find yourself drinking more and more coffee? This might be a nearly lost battle, but finals have not come yet, so you can prepare! At all cost, the goal is to reduce morning and late night caffeine, at least until the very end of the semester. Not all of us are coffee drinkers (Sue). Yet, there are many other components to good sleep hygiene. Avoid late night screen time and not watching Netflix so close to bedtime. You probably already know that one, but try this instead. Write a few of your paper notes by hand on actual paper and use those to study before bed, rather than having the laptop open. Also, try to make a schedule and make sure you put sleep on the list. Just remember, if you are refreshed and get some sleep, you’ll be more motivated the next day to learn! This can be a hard one to remember. Leisure and social participation are important. You won’t feel that OT school motivation to study if you are burned out from everything OT related. Make time for an adventure or go see a movie. We need occupational balance. I know, it may seem easier said than done, but you have to make time for fun. We all have different ideas of what fun is, find yours and make time for it!